View cart “WYZI 2.2 – Business Finder WordPress Directory Listing Theme” has been added to your cart. Understanding what online real estate business demands, we included in this theme viable functions such as Front-end submission, Membership Subscription, Google map integration, Advanced search, Property Featuring, dsIDXpress IDX Plugin support and more. To turn to the design, we make sure that it brings out premium look and feel to boost your credibility. Various property listing layouts are available and all are fully responsive. 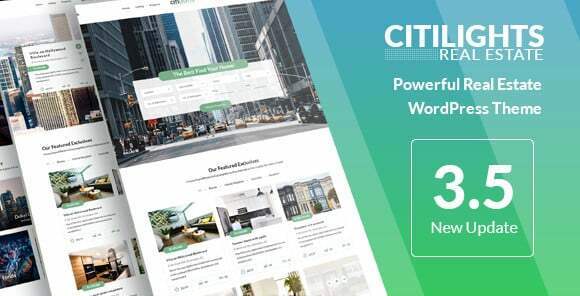 Whether you are building a Property Sales and Rentals website, or you are an agent/agency looking to expand your online presence, Citilights is the right fit for you. Optimized for mobile devices. Be it on a PC, smartphone or tablet, Citilights always looks SHARP and SLEEK. Apart from being able to submit property from frontend, registered users also have full control over their personal page. They are authorized to edit all information such as profile image, social networks, title, description, contact numbers. Properties are listed with Description, Featured Image and main information just as in list layout. Agents can quickly Make a property Featured or Mark property as Sold/Rent in one click. Twiddle with the configuration pane on the left, and see the theme changes accordingly on the right. – No Membership: Front-end registration is not allowed, only admin and those who have access to the backend can submit property. This is suitable for an agency’s site or an individual agent’s site. – Free for all Users: Registered users are free to submit property without making any payment and there is no limitation in the property listing. Select this membership type if your site is a free listing portal, or if you use another WP plugin that allows charging user at registration. It can also be used for agency’s site if you restrict user registration so that only your agents are able to log in and submit property from the frontend. – Membership Packages: Agents’ authority is restricted by the membership package assigned to them. You can change the number of listings and featured listings and the price of each package. By choosing this type, you will have the option to enable Freemium Membership. This feature allows registered members to have a number of free listings and free featured listings before being asked to purchase membership. – Pay per Submission: Select this to charge agent for every submission and featured property. This function allows users to locate themselves on the map and quickly find all properties available around their position. With powerful Theme Customizer functionality, feel free to coat your site with an unlimited number of color variations. One of the most powerful WordPress slider plugin which allows showing all kind of contents with breath-taking effects. It’s included in Citylights, saving you $18. Setting up and organizing your site is made easy with its built-in WPBakery Page Builder (formerly Visual Composer), a premium drag & drop builder plugin that allows you to generate unlimited pages in a flash. Custom fields provide additional information about the property. They will appear in the Property detail section in Property Page on the frontend, along with the default fields. You are free to add or remove any custom field. Besides an abundant list of Visual Composer’s shortcodes, CitiLights comes with specific shortcodes designed for real estate business. A specific Pricing table shortcode is included. It helps set up pricing table in a breeze by retrieving information from the membership package settings and display as content. Or you can stick with the regular Visual Composer’s pricing table shortcode, it’s also styled to fit the theme design. Choose between Slider and Video background for page header. The options are available in each page’s settings. There are 4 layouts for property showcasing: Grid, List, Slider. Additionally, there is a specific slider to display Featured properties or Single Property. All are available as Shortcodes. Upload an image to use a map pin. We included a PSD file to save you from the hassle. Follow the instructions in our documentation to install Demo content. After that, you will have a site just like our demo, only with dummy images replacing demo images. We recommend giving a glimpse at our document before starting the actual work. It’s well written and might save you plenty of time. We are a professional and dedicated team who wants to bring the best products and services to customers. If you have questions or need our support, feel free to pick our brain anytime from Mon to Fri (8:00am-5: 00 pm GMT+7).